Klamath smallscale sucker, captured from the maintstem Klamath River near Orleans, CA. Photo by Brian Hodge, Humboldt State University. Klamath smallscale sucker (mouth), captured from the maintstem Klamath River near Orleans, CA. Photo by Brian Hodge, Humboldt State University. The Klamath Smallscale Sucker appears to have a life history similar to other species such as the Sacramento and Mountain Suckers. 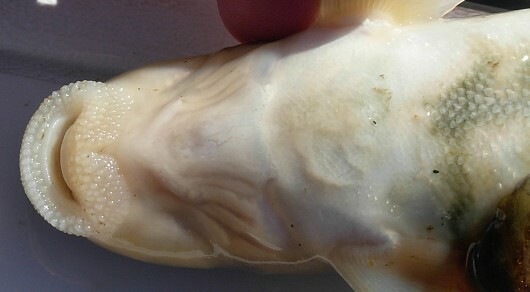 Smallscale Suckers are found primarily in deep slow pools of major rivers, though they may also occupy slow stretches of tributary streams and reservoirs. 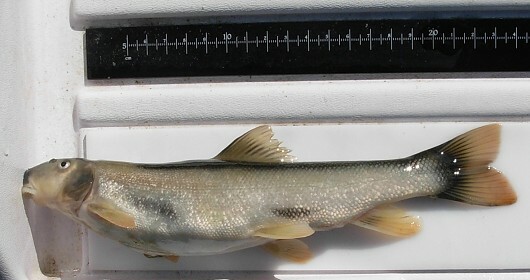 The Klamath Smallscale Suckers have been observed feeding in schools along stream bottoms and are often found in association with Speckled Dace, Sculpins, and juvenile Steelhead. Spawning by this species occurs in springtime, and adults move into tributary streams to breed. Females may lay 15,000 to 20,000 eggs which are then fertilized by the males. Juvenile suckers spend the first part of their life in small tributary streams before moving into larger water bodies. The Klamath Smallscale Sucker may live up to 15 years.